William Logsdail was born on May 25, 1859 in Lincoln, the county town (or county seat in the US) of Lincolnshire in Britain’s East Midlands region. The town’s earliest settlers were Iron Age Celts, followed by Roman legionnaires, Vikings and then Normans who built the medieval castle in 1068, two years after the Norman Conquest of England. Several decades later, work began on the Lincoln Cathedral which, together with Lincoln Castle, were still the most important architectural landmarks by the mid-nineteenth century when William Logsdail began to draw and paint them. His earliest art education was at the Lincoln School of Art and Design, the same place where his brother and sister were studying. The school had been established in 1863 as part of a national campaign to develop an artistically educated workforce that could create high quality design for Britain’s industrial economy. From the outset, Logsdail showed promise, winning a second prize in 1871 for “shading from the cast on models” at age twelve. [i] Shortly thereafter, he began studying with the headmaster, Edward Richard Taylor, RBSA (1838-1911), who was deeply involved in the design reform movements of the period. During these early years of study, Logsdail also won several prizes for his paintings of architectural subjects such as Lincoln Cathedral (1875, Usher Art Gallery, Lincoln), painted when he was sixteen years old. Logsdail moved to London in about 1876 to continue his education at what was then called the National Art Training School in South Kensington (it became the Royal College of Art in 1896). He also made his debut at the Royal Academy exhibition in 1877, where he would regularly show his work for many decades. In 1879, he left Britain to pursue further training at the Académie Royale des Beaux-Arts in Antwerp, the prestigious academy founded in 1663 by David Teniers the Younger. Logsdail probably traveled to Antwerp with his life-long friend and fellow artist, Frank Bramley (1857-1915) who had also studied at the Lincoln School of Art and Design in the 1870s. Once in Antwerp, both young men worked under the guidance of Charles Verlat (1824-90), a naturalist painter who had studied with Ary Scheffer in Paris. Logsdail’s painting entitled Almshouses, Antwerp (1880, Usher Art Gallery, Lincoln) illustrates the evolution of his work under Verlat’s tutelage. First, the subject matter depicts the lives of ordinary people who are struggling to make a living, in this case women doing laundry in the brick-paved courtyard outside the almshouses. Second, Logsdail was now using impressionist techniques to capture the effects of light and color; and third, this work reveals the influence of contemporary naturalist painters such as Jules Bastien-Lepage or Jules Breton, both of whom were widely respected in the European art world. Verlat was also an important influence on the young painter as an example of how an artist might develop his career through traveling extensively and through participation in the official salon exhibitions. Following their mentor’s example, Logsdail and Bramley traveled to Venice in 1881, after completing their studies in Antwerp. This move proved to be critical in Logsdail’s development as a painter. No longer a student, he found himself a member of the ex-patriot community of artists entranced by the romance of Venice; he seems to have associated with a number of Americans including Frank Duveneck, Robert Blum, James McNeill Whistler and John Singer Sargent as well as members of the Spanish arts community, including Martin Rico y Ortega. [ii] The tradition of ‘scene painting’ in Venice has deep roots in the eighteenth century works of Canaletto and Francesco Guardi, but the plethora of painters working there in the late nineteenth century almost mandated that each individual create a signature style to distinguish himself from the others. For Logsdail, this meant building on the naturalist approach that he had begun successfully in Antwerp. His first paintings of Venice featured not the major tourist attractions, but the backwater canals and unexpected views of the city. An 1885 view of Santa Maria della Salute (Usher Art Gallery, Lincoln) for example, focuses not on Baldassare Longhena’s extraordinary baroque basilica, but on a small canal lined with modest homes and a view of the church in the distance. Logsdail’s expressive brushwork and impressionist handling of reflections suggests that he was exploring new techniques and ideas, seeking perhaps to discover his own unique style. Logsdail’s most important Venetian painting of the 1880s was Piazza of St. Marks (Birmingham Museums and Art Gallery) painted in 1883 and exhibited at the Royal Academy in London in 1884. Larger than most of Logsdail’s previous work, (50” x 88”), this panorama of the crowds in the main square of the city was clearly intended as a major statement of his evolving naturalist aesthetic. The artist later described his experience in his unpublished memoirs, which he entitled Reminiscences: “In Venice I had set up my easel anywhere and everywhere. So accustomed are its people to painters, so friendly, understanding and sympathetic, and I had so hardened myself to the discomforts of working in a crowd, that often I painted on a big canvas in St. Mark’s Square, without interference, when the café tables outside were packed and the people promenaded up and down listening to the band.”[iii] As in his painting of Santa Maria della Salute, Logsdail’s attention is not on the architecture of San Marco in the background, but in this canvas, on the diversity of people congregating in one of the world’s most cosmopolitan cities; exotic Arabs, modest Italian families, extravagantly gowned women, soldiers in severe black uniforms, working men, bohemian artists, waiters, tricksters, children and assorted dogs. In the left foreground, there is a portrait of the bearded Edward Richard Taylor, the artist’s art professor at the Lincoln School of Art and Design, as well as two elegantly dressed women, one of whom seems to have been influenced by the work of Pierre-Auguste Renoir who had also painted in Venice in October 1881. Back in the London, the painting created a stir when it was shown at the Royal Academy’s annual exhibition in 1884. The critical and public response was very warm and, at age twenty-six, Logsdail seemed poised for a very successful career. For the next few years, he remained based in Venice, traveling periodically to North Africa, Turkey and Greece before returning to London in 1887, where he lived and worked at a Primrose Hill studio among the growing arts community there. Immediately upon his return to London, Logsdail began planning a series of paintings depicting the city itself. Like his Venetian scenes, these canvases offer naturalist images of the daily life of the people--unapologetically portraying the range of economic conditions experienced by Londoners. The best known of these is St. Martin-in-the-Fields (1888, Tate Britain) which again makes use of an architectural landmark as a backdrop to the life of the city. With the elegant neoclassical church looming against a cloud-filled sky, Logsdail directs the viewer’s attention to the young girl selling flowers in Trafalgar Square. She is not a pretty little urchin, but a raggedly clad ordinary girl who is probably about eight years old, and she is working long hours in cold conditions. In contrast, Logsdail includes a slightly younger girl walking with her well-dressed mother, both of them in warm, fur-trimmed coats. Like his naturalist colleagues in other regions of Europe, Logsdail holds up a mirror of the society he observes around him, and lets his audience decide what message to glean from the reflection. In spite of showing his London scene paintings at the Royal Academy and at various galleries, they did not bring him economic success. The social questions raised by the paintings may have been too challenging for the art-viewing public of the day, reminding them that their comfortable lives were wholly dependent on their willingness to accept the premise that children and poor people did not deserve to be paid a living wage. By 1890 when he painted the last of these canvases, Logdail’s health had been compromised by the long hours painting outdoors in the cold and rainy conditions of the city. In his Reminiscences, he remarked that “I could not go on. I was no better financially than when I began [the London paintings] and for some time I had been having attacks of giddiness and was in such a nervous state that I dare not cross a street without assistance.” [iv] To alleviate these ailments he left London for the warmth of the French Riviera where he recovered his health and produced a series of 69 small landscapes for a one-man show at the Fine Art Society gallery in New Bond Street. When he returned to London in January of 1892, Logsdail was introduced to Mary (May) Ashman who immediately attracted his romantic interest. He recalled in his later years that “there was something uncommonly attractive about her that made me ask her if she would care to see my studio. I can see her now as I opened my door to her. She arrived in a whiff of snow with sparkling eyes and rosy cheeks after her walk from Hampstead.” [v] She ultimately did agree to model for him, and on May 7th of that year, they married. Very soon thereafter, the couple moved to Venice where they lived until 1900 in the Palazzo Contarini. Their first child, Mary, was born in 1894, and Edward William appeared in 1896. At the turn of the century, Logsdail and May decided to return to England so that their children could be educated there. They left Venice for a short stay in Taormina, Sicily in 1900, but lingered for two years before finally taking up residence in London. 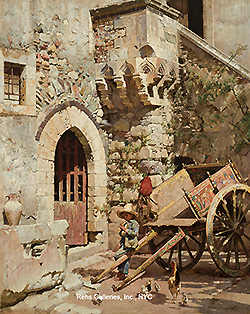 The stay in Taormina was productive however, resulting in 52 paintings that were exhibited in another one-man show at the Fine Arts Society in 1902. With the children enrolled at the Froebel Educational Institute, and financial security reasonably established, Logsdail began planning a new series of paintings, this time on English cathedrals. At the same time, he painted individual portraits of his wife and both of his children. To his surprise, the portrait of his daughter Mary, entitled An Early Victorian (1906, Usher Art Gallery), was proclaimed “The Picture of the Year” after being shown at the annual Royal Academy exhibition in 1907; suddenly, Logsdail was receiving many requests for portrait commissions. These were especially welcome in 1907 when a third child, Stuart, arrived somewhat unexpectedly. After World War I, Logsdail moved his family to the village of Noke just north of Oxford. Here, he continued to paint portraits, but also expanded his repertoire again to include landscapes and architecture. Sadly, his son Edward, who was a test pilot for the RAF, was killed in plane crash in 1923. It was shortly after this tragedy that Logsdail began writing his Reminiscences. Happier events followed in 1926 when Mary married, and again in 1932 when Stuart married. Logsdail painted consistently until 1937 when a severe case of shingles affected his ability to control his right hand. In subsequent years, he painted less and focused most of his attention on his garden, which enabled him to design in a different medium. He died at age 85 on September 3, 1944 at Noke. [i] John Lord, “A Student at Lincoln” in William Logsdail, 1859-1944, a distinguished painter, ex. cat. Usher Gallery, Lincoln, (Lincoln: Usher Gallery, Lincolnshire County Council Recreational Services, 1994) 20. [ii] See Richard Ormond, John Singer Sargent: Paintings, drawings, watercolours, (Phaidon Press Ltd, London, 1970) 29. Also see University of Glasgow, The Correspondence of James McNeill Whistler, Letter July 8, 1881, MS B88. Available online at: www.whistler.arts.gla.ac.uk/correspondence. [v] William Logsdail, Reminiscences (unpublished, written 1925-27), Coll. Logsdail family. Cited in William Logsdail, 1859-1944, a distinguished painter, ex. cat. Usher Gallery, Lincoln, (Lincoln: Usher Gallery, Lincolnshire County Council Recreational Services, 1994) 12.